If you are from Ukraine, Wales, Paraguay, Venezuela, Nigeria! 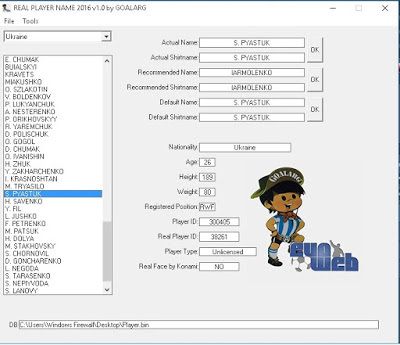 etc or Brazil and you are mad because National teams or brazilian teams have Fake Player Names, you can fix with this tool and play Online with real names, offline too. This tool search Real names from latest DLC for PES2008,09,11,12,13,14,15 and PES 2016 DB, this is its priority, if real name is not found there, (old konami DB), then it will recommend a Real Name for you, (obtained from footy web pages), you can post here if any real name is wrong or you have doubts about. Try Help in Tool section to see a step to step , it is easy to use.